Foodborne illnesses, also referred to as food poisoning, are the direct result of eating contaminated, spoiled or toxic food and symptoms can include nausea, vomiting and diarrhea and it can also be fatal in severe cases. On Thursday, 1 February, a concerned resident informed the Excelsior News of rotten food lying on the pavement in front of a shop at the Kempville Shopping Complex. The report was received at around 07:45, and it was evident that the shop was still closed when the complainant saw the heap of spoiled food. It begs the question, how did the rotten food end up in front of a shop? Upon questioning the witness, it was mentioned that the shop at which the food was found, is not in use and seems to be used as a storage facility. It was also stated that apparently the discharged food is left there by the people renting the shop and that they throw spoiled food out on a regular basis. 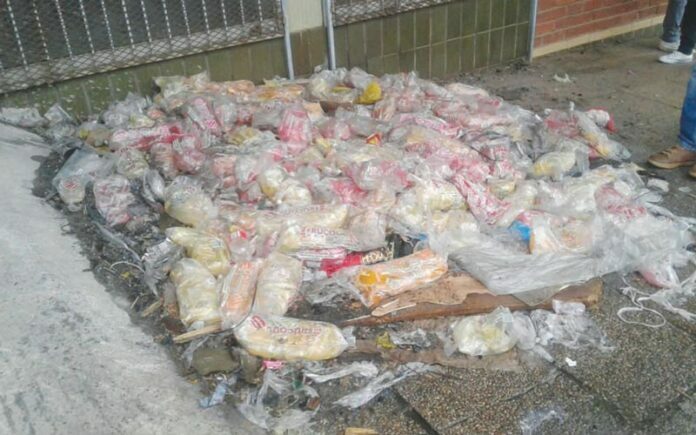 According to the witness, the smell was unbearable and it was clear that the items were dumped there, but what will happen if a hungry person or animal decides to eat some of the spoiled food out of desperation? If you ever become aware of a situation like this please contact Mr Dube on 082 065 4597 from Environmental Management.